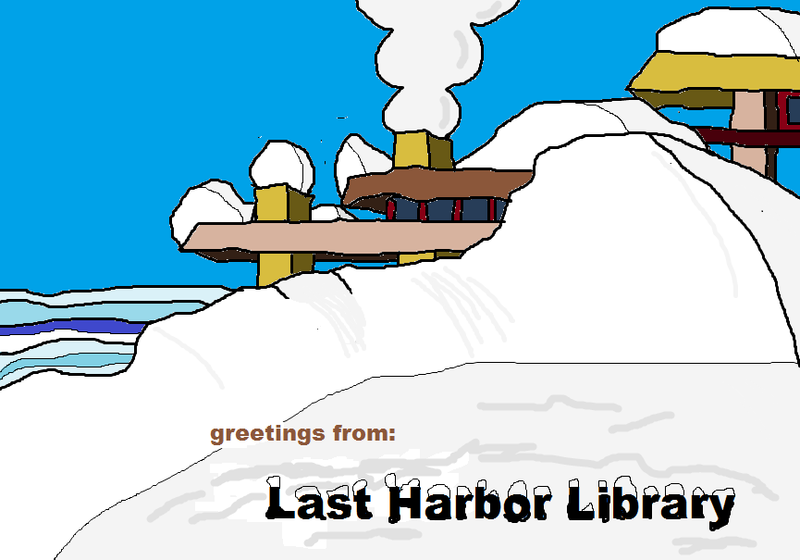 This is the fourth post in the blog of The Last Harbor Library. I received a few sharp words from my co-workers for my recent post in which I not only suggested that no one at my library does any work, but actually demonstrated them in the act of not doing it. These sharp words stirred up several questions in my mind. 1. Why are my co-workers reading this blog when they could be reading any number of books from our thorough collection of Medieval Literature, like The Mabinogion for instance? 2. Do my co-workers not know they're not working? I could demonstrate it for them so they become more familiar with what it looks like. But not now because I am too busy writing the library blog. 3. Would they rather I lie to the public here? Lie! In a library, the repository of human knowledge and truth! I am scandalized at the mere suggestion! 4. Do they think that all this not working is some fault of their own? There is nothing to do here! Nothing! This is due not to worker laziness. It is due to the fact the only person in all of Last Harbor, Minnesota, who would actually want to read The Mabinogion, which is the sort of thing our collection focuses on, is upstairs, so industriously refining our collection and micromanaging our library that she has time to read neither it nor this blog. 5. Are my co-workers unaware that this time belongs to them, to be enjoyed, because once the summer season arrives again they will all be fantastically overwhelmed? Have they forgotten the throngs of tourists who under no circumstances are interested in one of the greatest buildings in the world, our Frank Lloyd Wright designed masterpiece, when it is minus 20 degrees out, but are fanatically interested in it when it is a steamy, ice cream eating, 60 degrees out at the height of summer? Have they forgotten the endless tours, the convincing of people that even though we own not a single book by James Patterson, they might really like The Mabinogion (they won't), the complicated issuing of library cards to people living across the planet so that they can check out three books one time in order to never read them? Have they forgotten the mad carnival of events, shows, architectural lectures and confused tourists who descend on Last Harbor mistakenly thinking there is something of note to do here besides this library ("No, I'm sorry. I believe you're thinking of Grand Marais. No, moose rarely wander into town.")? Yes, my co-workers have forgotten. All people who live in an extreme climate share this in common: they are incapable of remembering the other seasons or any other conditions than the current ones. It requires so much effort to contend with these conditions that there is no room for that small bit of imagination that allows one to conceptually travel in time. It is, as I mentioned, minus 20 degrees out right now (I was neither kidding nor exaggerating). For us it is like this always and ever will be. But I have now lived up here for a bit less than three years, and so still retain, barely, a bit of the ability to see in the long view. I know that if you take the average of the whole year it is merely cold here, not insanely freezing, that it is not always dark, but balanced between light and dark pretty evenly, and that though we all have nothing to do now, averaged through one of our summers, we do our share of work. And so I say to anyone contending with a bitter, shut in winter, pick up a copy of The Mabinogion, or tune your internet dial to this blog, and stay calm when the truth is spoken. I visited this library (slightly different name, but I'm confident I was here) last fall. The staff, while not appearing overworked, did seem to be well occupied. One was doing some measuring, as I recall, preparing for an exhibit of some sort. They were friendly, and directed me to a very nice place for lunch. I like the idea of the work load being balanced across the year.